Music-- whether in the form of pop parodies, Broadway takeoffs, or consumer-spoofing jingles-- has been intrinsic to the "The Simpsons" since the show's beginning: The series' first episode found Bart reworking "Jingle Bells" to reference strip poker and Attila the Hun. In the decade to come, "Simpsons" writers would use song to skewer celebrity vanity ("We're Sending Our Love Down the Well"), American excess ("Canyonero"), the strained metaphors of country music ("Bagged Me a Homer"), and the gullibility of small towns (the legendary Music Man spoof "Monorail"), just to name a memorable few. Now, any halfway-respectable "Simpsons" fan has seen every episode from the show's first decade multiple times. We continue to watch, either out of comfort, nostalgia, or just flat-out enjoyment, but by this point we've become so familiar with every sight gag and plot twist from the golden era of the series that the vast majority of the material (music included) has lost some of its capacity to provoke or entertain. 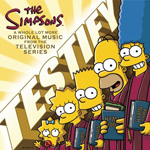 The recently released Testify collects songs from "Simpsons" seasons 11 through 18, a period roundly acknowledged as right about when the show's quality began to slip perceptibly. In truth, that span did produce a number of enduring moments and excellent episodes (unless names like Mr. Pinchy, Linguo, Jebus, and Max Power fail to ring any bells), but even if you hold the second "Simpsons" decade in significantly lower esteem than its first, at least this compilation has the benefit of being fresher, right? Well, not necessarily. The sad irony behind Testify is that while fans of the series have grown accustomed to reruns of its initial offerings, the songs from these eight seasons have demonstrated an increasing over-familiarity with the show's iconic characters and their quirks, to the point where the music of "The Simpsons" has become less a vehicle for intelligent satire and more an exercise in self-referentiality. Perhaps it was inevitable given the show's longevity and the indelible nature of its creations, but it's hard not to listen to Testify and disappointedly marvel at how many of these songs are about "The Simpsons" and little else. "They'll Never Stop the Simpsons" is the obvious moment of meta-commentary, but at least it's knowing in its insularity. But play tracks like "The Very Reason That I Live", "Sold Separately", "My Fair Laddy", and "The President Wore Pearls" for someone who lacks an intimate knowledge of Sideshow Bob, Waylon Smithers, Groundskeeper Willie and Lisa Simpson, respectively, and watch the laughter die. When the "Simpsons" team does look beyond the mirror, they're still capable of delivering estimable satire and sneaky, off-the-wall hilarity. "America (I Love This Country)" cannily finds a Lee Greenwood stand-in crooning, "If you don't buy my record/ Al-Qaeda wins," while "I Love to Walk" gives us the bizarrely great non sequitur of Steve Buscemi offering tickets to the Independent Film Awards to two guys from Turkmenistan. On the other hand, a healthy portion of the pop culture jokes and references here are well past their expiration dates. Granted, that's the point with "Ode to Branson" (a haven for washed-up stars like Yakov Smirnoff and Mr. T), but there's absolutely no excuse for consecutive songs that parody the B-52s' "Love Shack" and the California Raisins. Remember, in Soviet Union, shark jumps you. Revealed: White Stripes on "The Simpsons"
White Stripes to Appear on "The Simpsons"